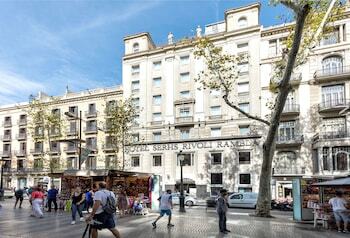 With a stay at Hotel SERHS Rivoli Rambla, you'll be centrally located in Barcelona, steps from Placa de Catalunya and 7 minutes by foot from Palau de la Musica Catalana. Featured amenities include complimentary newspapers in the lobby, dry cleaning/laundry services, and a 24-hour front desk. With a stay at Hotel Ses Figueres in Ibiza, you'll be on the beach, within a 15-minute drive of Ibiza Castle and Talamanca Beach. Featured amenities include a 24-hour front desk and luggage storage. With a stay at Hostal Can Feliu in Santa Susanna, you'll be within a 15-minute walk of Santa Susanna Beach and Pineda de Mar Beach. Featured amenities include multilingual staff and luggage storage.